Pick up a Tomkins Custom guitar or bass. Turn it over in your hands. Examine the craftsmanship, the detail, the colour, and then play. No instruments like these ever rolled off a production line. 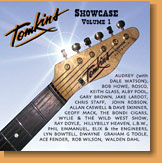 Pick up the album Tomkins Showcase - Volume One. Turn it over in your hands. Put it in your CD player and then play. Listen to the craftsmanship, the artistry, and the diversity. No artists like these ever rolled off a production line. Compiled by Bob Howe, Keith Glass and Allan Tomkins. Photos by Bob Howe, John Elliott, Terry Phillpot, Lou Farina and many others. who were all so generous with their talents. To purchase this album on-line, visit The Country Music Store. Also available at good Australian record stores - distribution via One Stop Entertainment.